Take a trip through the life of one of the greatest singers of all time, Whitney Houston, the epitome of superstar, an “American Princess” and the most awarded female artist ever. 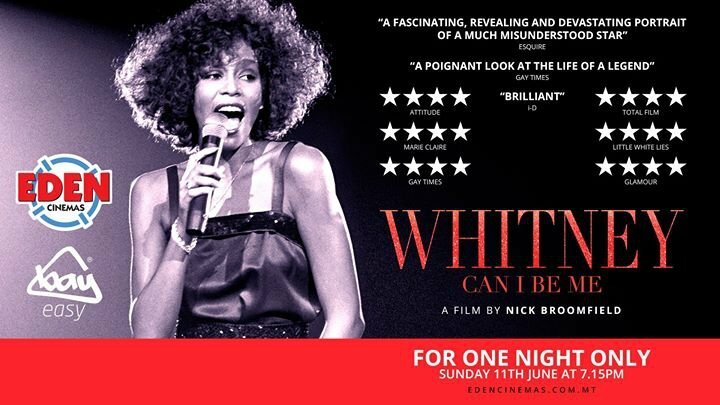 Eden Cinemas will be screening a one time show of Whitney “Can I Be Me”, on Sunday 11th June at 7.15pm, followed by a Q&A with acclaimed director Nick Broomfield and a tribute performance by Michelle John from The Voice, brought to the big screen live via satellite. Broadcast live from Sheffield Doc/Fest, this exclusive event creates the ultimate Whitney moment with largely never-seen before footage and exclusive live recordings. Shaped to be one of the world's most popular female vocalists, Whitney Houston had it all. Yet although Whitney made millions of dollars, had more consecutive number ones than The Beatles, and became recognised as having one of the greatest voices of all time, she still wasn’t free to be herself and died tragically, in a hotel bathroom alone - at just 48 years old. 'Whitney, Can I Be Me’ tells Whitney Houston’s emotionally lucid and poignant life story with insights from those closest to her. From acclaimed documentarian Nick Broomfield and iconic music video director Rudi Dolezal comes a new film about one of the greatest singers of all time. Immerse yourself into the dramatic rise and fall of record-breaking pop diva Whitney Houston.